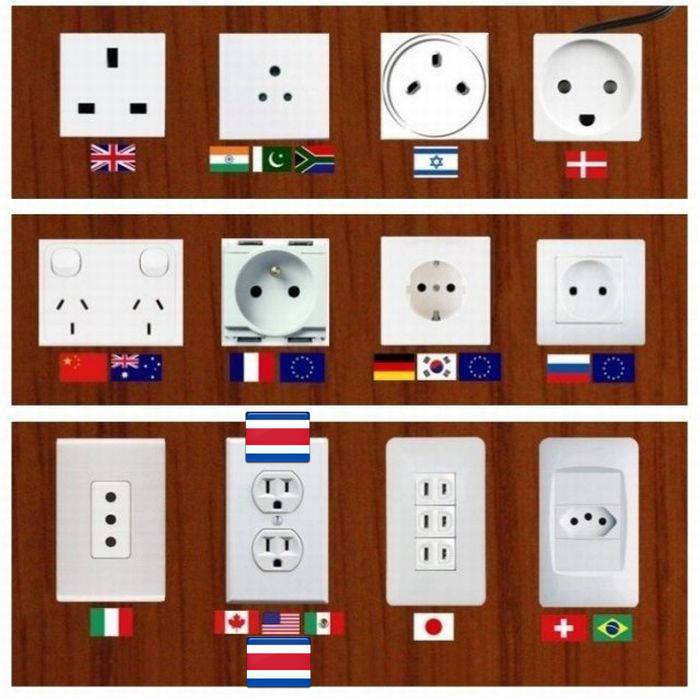 Electrical sockets (outlets) in Costa Rica are like the electrical outlets found in Canada, Mexico or the U.S., and if your device has a North American plug, it’s probable that you won’t require any adapter at all in order to plug in there. But it is important to realize that there are two potentially very significant physical variations that may need to be approached with an adapter: grounding and/or polarization. If your plug has one or both, and the socket doesn’t, then the plug may not physically be able to fit into the socket without an adapter. In the case of a North American appliance plug, grounding is accomplished by the third, round pin beneath and below the two vertical blades on the plug. Polarization is accomplished by the left vertical blade being taller than the right so that the plug can’t be inserted upside down. U.S. and Canadian sockets are required to be both grounded and polarized. But in Costa Rica and other areas which use U.S. style sockets, grounding and polarization often are not required, and in fact, the majority of sockets in many of these areas do not accept the taller blade and/or the third grounding pin. This will prevent a North American appliance plug from being able to plug into these sockets if the plug is either grounded or polarized. But the shape of the socket is only a part of this! Electrical sockets (outlets) in the Costa Rica ordinarily provide electricity at between 110 and 120 volts AC. If you’re plugging in a U.S. or Canadian 120-volt appliance or an appliance that is compatible with multiple voltages, then an adapter is all you need. So how do I know whether or not my appliance is compatible with 110-120 volts? If your appliance is from the United States or Canada, then it is. That’s the standard in North America. Otherwise, the short answer is: The only way to know is to check, and there’s absolutely no getting around that crucial step. Electricity is a delicate matter, and if you are wrong, then you may burn your device or worst, start a fire. That being said, most modern “digital-age” appliances (especially ones that run on batteries) are being built to be compatible with all worldwide voltages, from 100 volts in Japan to 240 volts in the United Kingdom. This normally includes laptops, PDAs, cell phones, digital cameras, digital camcorders, many compact video game devices, digital music players, etc. More and more personal grooming items like hair dryers curling irons, shavers (especially cordless ones) and such are being built to be compatible with multiple voltages as well, however in many cases they aren’t. “Conventional appliances” like kitchen items, audio/video equipment, vacuum cleaners, lamps and lights, and most bath appliances are not compatible with multiple voltages. Again, the only way to know is to check. A common misconception is that there’s any such thing as a “standard” electrical input for appliances. There’s not. They’re all different. Where can you find the information regarding your device? Input: ~100-240V 50/60Hz 65W — This means the appliance is compatible with multiple voltages. This item can be brought just about anywhere in the world, and any difference in voltage is basically irrelevant. The appliance (or charger) adjusts itself to whatever voltage it receives. The only issue is whether or not the plug can physically interface with the socket. The appropriate travel plug adapter is all that’s needed. —or— Input: 115/230V 50/60Hz 200W — This means that the appliance can be switched between 110-120 volts in North America and 220-240 volts in other parts of the world. This is common of desktop computers and some hair dryers/curling irons/etc. You probably have to physically flip a switch somewhere, but as long as that switch is in the proper position and you have the appropriate plug adapter, you’re fine. —or— Input: 220V 60Hz 2.8A — This means that the device is only compatible with a single voltage, in this case, 220 volts. If the socket is 110-120V, then an adapter by itself isn’t enough, because travel plug adapters do not change the voltage supplied by the socket. Plugging it in with just an adapter can “fry” it because the voltage is different from what the appliance requires. To use this appliance safely, the voltage needs to be changed from 110-120 volts to 220-240 volts by way of a voltage transformer. It’s important to understand that there’s no such thing as a “standard” electrical input/output for electrical appliances. The information below is just a general guideline, and it may or may not be correct for your specific brand and model. The only way to know for your specific appliance is to check. Laptop computer: Usually 100-240V, 50/60Hz, auto-switching. A travel plug adapter works just fine all by itself. Cell phone: Usually comes with a charger that is 100-240V compatible, but that is by no means always the case. It’s very important to check the charger. If it says “100-240V” then a plug adapter will work fine. If not, the easiest solution is probably to contact your cell phone provider and buy a new charger which is multi-voltage compatible and attach the appropriate plug adapter to the multi-voltage charger. PDA/Blackberry/etc: Almost always comes with a charger that is 100-240V compatible. Simply attach a plug adapter to the charger’s plug. Digital camera: Chargers are usually 100-240V compatible. A plug adapter is usually sufficient. Hair dryer/curling iron/flat iron/etc: Most non-North American hair care appliances are only compatible with 220-240V, though some higher-end models can be switched between voltages. If your brand/model has a voltage switch, then a plug adapter is sufficient. Otherwise, the appliance will require that the voltage be changed by way of a voltage transformer. Electric shaver: Most non-North American corded electric shavers are only compatible with 220-240V. Cordless/rechargeable shavers often come with chargers that are 100-240V compatible. CPAP Machine: 50/50 shot, there’s no telling. A lot of CPAP machines are built with DC motors because they’re quieter. DC motors plug into AC power sources, of course, through an AC adapter. Since AC adapters are converting an AC voltage to a smaller DC voltage anyway, the AC input voltage is often irrelevant. If the AC adapter says “100-240V” then a plug adapter will work just fine. But this is by no means true of all CPAP machines. Some brands/models use AC motors and are only compatible with 220-240V. If that’s true of yours, then theoretically a voltage transformer + a plug adapter would at least allow it to power up. But in practice, the difference in frequency (Hz) may negatively affect the machine’s performance. For most appliances, the effect is negligible. But for a CPAP machine, t the effect can be significant. The better solution may be to just buy a multi-voltage compatible CPAP machine, rather than to depend on a transformer. iPod/Iphone/Ipads: You’ll have to check the iPod’s charger. There are so many different versions, it’s impossible to keep up with what kind of charger ships with any particular model. If the I Device charger says “100-240V” then a plug adapter is sufficient. Otherwise, if it says “220V” then you’ll need a voltage transformer. Or you’ll need to replace the iPod’s charger with one that is 100-240V compatible. If your appliance is already compatible with 110-120 volt electrical input, one or more of the following travel plug adapters (depending on which type of outlet is installed in any given specific building) will allow you to plug in. Click the link to view theAdaptalec.com ordering page for that adapter. In some lodges, you may find electric converters but it is not the usual and should not be expected. In others, certain devices like hair dryers could be a problem (Some lodges use mainly solar power, for example) and are not recommended. Please ask your travel consultant and the lodge (Upon arrival) about the use of such appliances.